If one had to provide a simplified description of Escobar’s new album, Bird of Prey, it would be summed up as a barrage of electrified grunge trash rock ‘n roll, which serves only to excite. This is more than obvious after checking out the opening track, ‘You Must Get Stoned.’ It sets the tone for Bird of Prey by inviting the listener to a sound that is profusely upbeat, wild and frenetic. 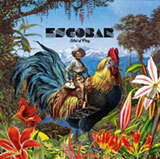 This is a style that remains largely consistent throughout the album, as Escobar tends to lean toward the edgier elements of garage-like stoner rock ‘n roll, with obvious indications toward grungy and greasy sounds. It’s something that boasts a certain familiarity and even borders on addictive.